Flagship speaker in the D300 range, sitting above the D310 and D330 bookshelf speakers with dual 5" drivers. Earn 469 loyalty points when you order this item. Wharfedale D330 is the largest speaker and only floor-standing speaker in the D300 series, sitting above the entry-level D310 and D320 bookshelf speakers with dual 5" Black woven kevlar cone drivers for mid and bass. 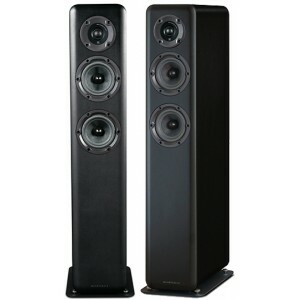 This range exceeds conceptions of how good a ‘budget’ speaker range can be. Wharfedale created the blueprint for modern ‘budget’ hi-fi speakers in the 1980s with the first-ever Diamond – the classic entry point to high-fidelity sound. Almost four decades on, Wharfedale again redefines the low-cost, high-performance speaker concept with an all-new range - the D300 Series. The range consists of four models: two compact stand-mount speakers the D310 and slightly larger D320 plus a floor-stander called the D330. 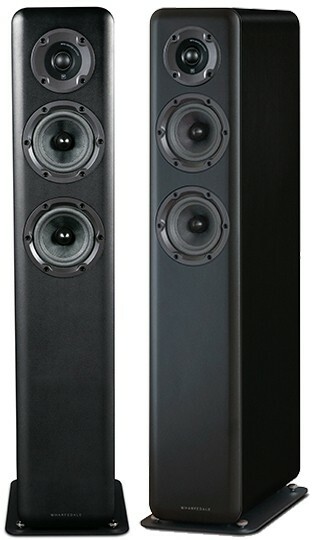 These are joined by the D300C centre channel speaker for home cinema systems. The range attains even lower price points the existing Diamond 11 Series. While the D300 models forfeit the curved cabinet sides of the Diamond 11 speakers, their modishly styled enclosures incorporate many similar technologies, re-designed and engineered specifically for the new range. The drive units and bass reflex system are especially noteworthy – no other speaker range delivers such high specifications at such low prices. The D300 Series incorporates the most advanced drive unit systems ever seen in such an affordable loudspeaker range. For the bass/mid drivers, the latest generation of Wharfedale’s long-established woven Kevlar cones are bonded to a super-lightweight surround made of hi-tech foamed polyether, delivering remarkable clarity, texture and musical expression. These cones are driven by a super-long-throw voice coil motor system, enabling low-frequency linearity and accuracy that is exceptional for such low-cost loudspeakers. The use of a specially shaped one-piece pole plate fitted with a copper cap reduces inductance and controls the magnetic flux, ensuring low distortion through the critical midrange area. A technology pioneered by Wharfedale in the 1960s, the oversized ceramic magnets ensure high sensitivity, smooth response and absolute control of cone movement over lower bass frequencies. The driver assembly is mounted in a specially designed basket with a network of ribs to increase rigidity, thus improving transient impact. A large open area behind the cone reduces early reflections and allows the internal cabinet absorbent to do its work. Developed for the Diamond 11 Series and fine-tuned for the D300 range, Wharfedale’s WFR (Wide Frequency Response) tweeter incorporates its own 'cabinet' – a precisely shaped rear chamber damped with a fibre filling. An over-sized ceramic magnet, selected to give a smoother transition from midrange to high frequencies, is attached to a pole piece with copper cap for flux control. The pole piece is vented through to the rear chamber to achieve a low resonant frequency, ensuring excellent linearity and allowing the textile dome, sited within a dished waveguide to contribute to a wonderfully lucid midrange as well as smooth, pure and richly defined high-frequency detail. The output of the drive units is carefully combined by a thoroughly researched crossover developed using Wharfedale’s Advanced Software and Listening Iteration system. Each crossover is carefully evaluated using a wide range of music, with the emphasis being on the lifelike reproduction of voices and instruments in addition to the dynamics of the musical performance. Crossover components feature low-loss polypropylene capacitors and laminated core inductors for optimum transfer of the music signal. The acoustically profiled cabinets feature 28mm-thick front baffles – a luxury, engineering touch to such low-cost speakers – profiled at the edges to reduce diffraction edge reflections at mid to high frequencies. Critical bracing of the cabinet panels contributes to the eradication of audible resonance and, combined with the rounded cabinet edges, yields a rigid base on which to mount the drive units. In addition, the cabinet walls are lined with a specially developed internal fibre, chosen for its outstanding absorbent qualities across a wide bandwidth. The result is that the listener hears the drive unit output unsullied by unwanted colorations caused by panel vibration or internal resonances, revealing more of the detail of the musical performance. Developed from the Slot-Loaded Distributed Port found in the Diamond 11 Series, the D300 Series’ P-EQ (Pressure Equalisation) port system is critical to the speakers’ deep and controlled bass performance. Low bass frequencies emitted from the rear surface of the bass driver travel through a downward-firing port in the base of the speaker, with precisely curved openings to smooth airflow. These frequencies exit into the room omnidirectionally through a gap between the cabinet and the plinth on which it rests formed by four ‘feet’ attached to the speaker’s base. This reduces the pressure differential between the high pressure in the port and the low pressure in the room, thus eradicating the turbulence and audible ‘chuffing’ suffered by conventional ported systems whilst aiding bass reflex efficiency. The result is a natural recreation of the fundamental notes of bass instruments, matching the realistic sound of the midrange and treble characteristics. It also allows the listener to position D300 Series speakers closer to a rear wall than would be possible with conventional rear-ported speakers, helping to make them less obtrusive in a room setting. Wharfedale called upon the talents of well-known specialists to develop the D300 Series, the teams led by esteemed specialists created a range of ‘budget’ speakers that punch far above their weight, elevating expectations of what can be achieved at such lowly price points. Industrial design was delivered by Kieron Dunk who has created award-winning designs for the likes of Q Acoustics, Denon, Marantz, Mission and Quad. Acoustic performance was managed by Peter Comeau, Wharfedale’s Director of Acoustic Design and one of Britain’s foremost loudspeaker designers. Despite the speaker's compact size, the soundstage they produce is substantial and engaging, their expressive midrange definition transitioning seamlessly with fluid high-frequency detail. Bass, meanwhile, reaches surprising depths yet remains lucid, accurate and controlled, thanks to the speakers’ advanced bass drivers and P-EQ bass reflex port. Whether the music is driving and energetic or soft and subtle, from rock and electronica to classical and jazz, the D300 Series speakers deliver captivating sound.